The RX-950 ProRower from H2O Fitness is one of the water rowing machines that meets all the gym standards. But one of the best aspects about it is that it’s not an overpriced rower, and considering its capabilities and construction, we can safely say that it’s actually an affordable rowing machine. As its name suggests, it’s a rowing machine with water resistance. And since it’s a rower made for gym standards, it’s basically a model for users of all levels of fitness. The H2O ProRower RX-950 is pretty similar to the RX-750 model, at least when it comes to the construction of the tank, and rowing system. However, there are several major differences between the two. We’ll put them all into view within the following part of this post, along with just about everything that you should know about this particular rowing machine. This rower is equipped with a 4.5 gal. (17 liters) water tank, furnished with a 3-blade impeller. The “drive” system of the rower also involves a transmission belt and a 1″ nylon durable bungee cord attached to the rower’s handle. With each rowing motion, the impeller spins into the water tank, generating a resistance feeling and sound pretty close to rowing an actual boat. Evidently, since this rower features a water resistance system, the resistance is “naturally adaptive”. In other words, the more strength you put behind your stroke, the more resistance you will meet. The water tank doesn’t feature any resistance adjustment dial, like the one on the FDF Newport rower for example. However, the overall resistance can still be adjusted by adding or removing water from the tank. 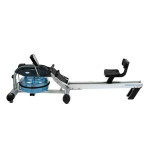 The rower comes with a siphon which facilitates the filling or emptying the tank. When filled at maximum 4.3 gal. (17 liters) capacity, you will benefit from maximum resistance. Conversely, 3.6 gal. (9 liters) is the minimum recommended water quantity to place in the tank, which dictates the minimum overall resistance that the rower can generate. As a general idea, at maximum fill this rower offers quite a consistent resistance. Actually, a user who isn’t accustomed to rowing should find it quite difficult to maintain a higher speed or stroke frequency for several minutes. To begin with, the ProRower RX-950 is made of a combination of anodized aluminum and stainless steel. The front part of the frame features a guard that covers the transmission belt, keeping the drive system away from the reach of children or pets. Needless to say, all metallic parts are corrosion-resistant. Overall, the rower has quite a professional aspect, which can also serve as a motivation factor. Its gliding rail, has a different construction than in most other rowers though. It’s actually a double rail, with the seat attached in the middle. Given this fact, the rail assembly can withstand a high user capacity, as specified, up to 550 lbs (250 kg). 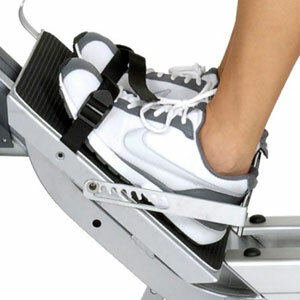 Also, it has a subtle incline, which results in a better workout for the legs, and a slightly faster recovery motion. The RX-950 has a larger footprint than both the other models from H2O fitness, the RX-750 and RX-850. It actually occupies quite a portion of floor space, with an assembled footprint of 89″L x 26″W (226 x 66 cm). But this being said, this rower can actually accommodate users of all sizes. Even if you’re 6’8″ – 6’9″ (203-206 cm) tall, you shouldn’t have a problem with the rail being to short, and with each rowing motion you should benefit from a full leg stretch. 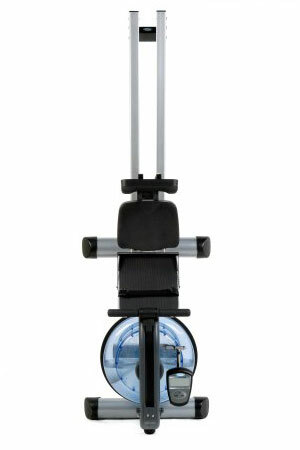 The frame features 3 bases. The front and middle bases feature black plastic caps and adjustable leveling feet, with rubber caps, to supply maximum stability, and also prevent any damage to the floor. The frame of this water rower does not feature a folding design like most air rowers, such as the Sole SR500 or the Stamina ATS 35-1405. However, it can be stored vertically. The front tube which also serves as a guard for the water tank, actually features a small base offering more stability for the upright storage position of the machine. When in vertical storage position, the footprint of the machine becomes 30″L x 26″W (76 x 66 cm). Also, even though the rower may seem pretty close to the floor, its top is actually 30″ (76 cm) above the floor level, and it won’t fit under the average bed. The H2O ProRower RX-950 features a seat without cushioning, but with a contoured design, excellent ergonomics, and top-quality rollers. As opposed to the seat of the RX-750 model, this one can be furnished with a lumbar support. This accessory is not included though, but available as an optional purchase. 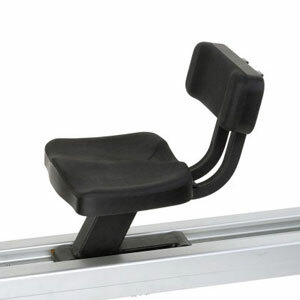 Last but not least, this rowing machine is equipped with a pivoting footrest, which is quite a plus since you can get the angle that feels the most comfortable to you. The footplate features adjustable straps and a quick-adjust heel support. The performance monitor or console that comes with the RX-950 rower is rather simple and easy to use. But nonetheless supplies information regarding all the values that a professional rower would like to know during their training. First of all it can track distance, time, calories per hour, strokes per minute, and heart rate. There’s also a 500M split time function, which indicates your timer for 500 meters of rowing. This function is actually great if you want to continuously improve. The console unit requires 2x AA-type batteries. It features 3 buttons: MODE, SET and RESET. 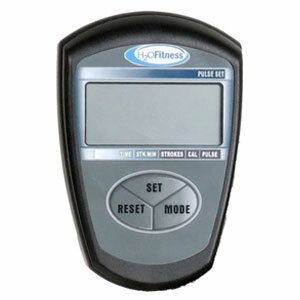 It will start as you begin your activity on the machine, and will enter sleep mode 3 minutes after ceasing your rowing. You can setup goals for time, distance and heart rate, via the MODE and SET keys. Also, the console features a SCAN function which displays each value for 5 seconds. Nonetheless, you can lock the value you want to follow on screen. Since the unit can track pulse and there are no sensors in the handlebars, it’s pretty obvious that it’s telemetry enabled. In other words, it can communicate with a heart rate chest strap. This accessory is not included though. Due to the fact that this machine is rather heavy, assembly isn’t exactly cake. You either ask someone to help you, or move the machine piece by piece into the room where you will be assembling and using it. But overall, the assembly process isn’t too complicated. Shouldn’t take more than one hour. Tools for the assembly are supplied, as well as the manual. The water tank comes attached to the front part of the frame. All you have to do is attach the rail system to the front part of the frame, the seat, the rear base and connect the console. When it comes to maintenance, the frame itself doesn’t require much. Just keep it dust-free, and remove any dirt that may fall onto the seat rails. If the seat rolls over any hard small objects, even sand, this might cause nicks into the rail. The water in the tank calls for periodical replacement. Also, the unit is supplied with several chlorine pills to add into the water, to prevent to formation of algae in the tank. Great price for a commercial quality piece of equipment. Lumbar support for the seat and HR chest strap transmitter are not included. If you’re looking for commercial quality in a water-based rowing machine, you can be sure that the RX-950 ProRower from H2O has it. Even though this model has been around for a couple of years, it’s still a top-rated rowing machine, offering an excellent rowing setting for users of all levels of fitness and sizes. It’s a machine that can supply a consistent cardio workout, a great workout for the legs, torso and arms, the rowing feeling generated by it is pretty close to rowing a boat. Thus, working out on this machine after a busy day at work can also serve as a great stress relief. Finally, it’s a machine with a great price/quality ratio. Even though it costs over $1,000, it’s pretty much worth every penny.